The Flexzilla Garden Hose had 1,846 customer reviews and 128 answered questions on Amazon as of this writing. I've read through the reviews and condensed the results into this review. I hope that this helps you when shopping for garden hose. The Flexzilla Garden hose is made for -40 to 150 degree fahrenheit temperatures. It has an abrasion resistant outer cover along with crush resistant anodized aircraft aluminum fittings. It is made to coil easily and lay flat with no memory. The superior O-ring was designed for long-term, leak free connections. This hose is lead free and advertised as drinking water safe. It has a kink resistant rib inner core design, though customers have reported that it kinks like most garden hoses do. The majority of hoses that I've reviewed were labeled as not drinking water safe. That really can limit what you can use it for. This hose can be used for filling up drinking jugs, filling up your RV with drinking water and countless other uses that you would use for a drinking water hose. However, with this being said, customers had a lot of questions as to what the hose was made of and if it was truly safe for drinking water. It was difficult to find evidence supporting the safety claims, particularly in terms of lead and phthalates. The hose manufacturer website does not provide that detailed information. The Amazon product page states that the company claims that "the hose meets or exceeds the standards set by the National Sanitation Foundation." Unfortunately the Flexzilla Garden Hose does kink. A large number of customers reported kinking just like typical garden hoses do. Some provided photos of it kinking. As reported by one of many, "This hose is really no different than any other hose other than it's more pliable. I'm really tired of companies advertising that hoses don't kink, it's just not true. This hose does kink, arguably the same if not more often than a normal hose." This customer attached a photo of the Flexzilla Garden Hose with a kink. This hose weighs 8 pounds. So it is not going to be a lightweight type of hose. If you are looking for an ultralight hose, this just isn't going to be the one to get. The hose has anodized aluminum-alloy fittings at both ends. Customers found that it is better to turn off the water when the hose is not in use (as corrosion occurs when the metals are bridged by water) and to remove the hose from the bib as often as possible between uses. This is not a heavy duty hose, so the fittings will not hold up to much abuse. One customer reported, " I had one male end fitting fail, but that was because I have very high water pressure in my house and I left the faucet on for several months before the hose started to enlarge at the fitting and eventually sprung a leak. The only replacement fitting that worked was a barbed hose fittingwith a clamp tightened around it. But the hose isn't made to be used under these conditions." The majority of customers left feedback stating that this hose did not leak. However, there was also a substantial amount of customers who said that it did leak. I'll give you both ends of the spectrum. Here is a happy customer comment leaving feedback about the hose not leaking - "The ends have held up nicely without leaking or spraying near the joint. I'd spend twice the $ for flexzilla anyday. The quality of material and construction in flexzilla products I've experienced have no equal." And the other side of the coin, "Like many have said, there's not enough threads on it so it leaks pretty bad. I tried putting another gasket in it, but that didn't seem to have any effect on it." The Flexzilla Garden Hose is a fairly heavy weight hose that is advertised as drinking water safe. However, neither I nor customers who left feedback could find detailed information about the details of the hose material. Unfortunately, this hose had plenty of reports of it kinking. However, it shouldn't kink anymore than a typical garden hose would kink. But if you are set on a kink-free hose, this is not going to be the one. As far as the fittings to and whether or not this hose leaks, there were mixed reports. About half people who left comments about leaking said it did not leak, while approximately the other half said it did leak. 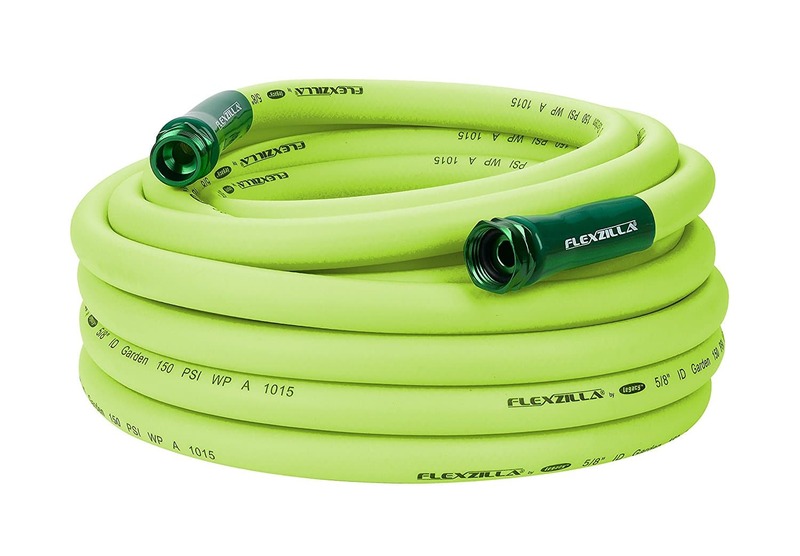 If you are looking for a basic garden hose, of mid to heavy weight that is listed as drinking water safe, you may want to check out the Flexzilla Garden Hose. The majority of the reviews left for it by customers were positive. Here are some top questions that I found for people considering buying a Flexzilla Garden Hose. How flexible is the 3' length, really? If I use it in a dog wash, will it bend around easily? The Flexzilla Garden Lead-in Hose is very flexible and will bend around easily at your dogwash. Can another flexzilla hose be attached to this one? If it can do I need special connectors? Yes, just like with any other hose, you can connect another Flexzilla hose to this one. No special connectors are needed. Does this hose come in any other color except the bright green? Yes, the hose actually comes in a Terra Cotta HFZC550TCS and a Brown Mulch HFZC550BRS. These hoses are 5/8" x 50' with SwivelGrip ends.